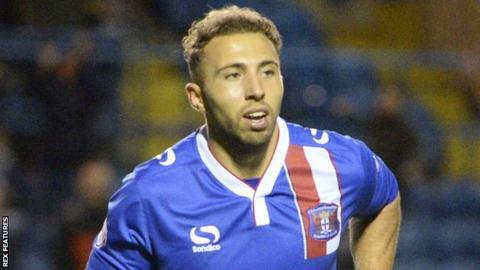 Hallam Hope scored the only goal as Carlisle beat Hartlepool to boost their League Two play-off hopes. Pools had the better of the early chances, as Luke James fired wide and Billy Paynter had a shot blocked. Jabo Ibehre came close to putting the hosts ahead after the break, but his close-range header was kept out by Hartlepool keeper Trevor Carson. Hope's deflected shot put the Cumbrians ahead, and they held on to move within one point of the play-off spots. Hartlepool remain 17th in the table after suffering their first defeat in eight games. Match ends, Carlisle United 1, Hartlepool United 0. Second Half ends, Carlisle United 1, Hartlepool United 0. Corner, Hartlepool United. Conceded by Mark Gillespie. Attempt saved. Jake Carroll (Hartlepool United) left footed shot from the left side of the box is saved in the bottom left corner. Attempt saved. Nicky Featherstone (Hartlepool United) right footed shot from the centre of the box is saved in the centre of the goal. Attempt missed. Brad Walker (Hartlepool United) right footed shot from outside the box misses to the right. Nicky Featherstone (Hartlepool United) wins a free kick on the left wing. Attempt missed. Lewis Hawkins (Hartlepool United) right footed shot from outside the box is just a bit too high. Attempt missed. Rakish Bingham (Hartlepool United) right footed shot from outside the box is just a bit too high. Rhys Oates (Hartlepool United) wins a free kick on the right wing. Substitution, Carlisle United. Antony Sweeney replaces Alex Gilliead. Carl Magnay (Hartlepool United) wins a free kick on the left wing. Corner, Carlisle United. Conceded by Jake Carroll. Corner, Hartlepool United. Conceded by Brandon Comley. Corner, Hartlepool United. Conceded by Tom Miller. Goal! Carlisle United 1, Hartlepool United 0. Hallam Hope (Carlisle United) right footed shot from the centre of the box to the high centre of the goal. Assisted by Macaulay Gillesphey. Attempt missed. Luke James (Hartlepool United) left footed shot from the centre of the box is just a bit too high. Substitution, Hartlepool United. Rakish Bingham replaces Billy Paynter because of an injury. Attempt blocked. Alex Gilliead (Carlisle United) right footed shot from the right side of the box is blocked. Attempt missed. Hallam Hope (Carlisle United) right footed shot from outside the box is just a bit too high. Attempt saved. Luke James (Hartlepool United) right footed shot from the right side of the box is saved in the bottom right corner. Attempt saved. Jabo Ibehre (Carlisle United) header from the centre of the box is saved in the bottom left corner. Second Half begins Carlisle United 0, Hartlepool United 0. Substitution, Carlisle United. Hallam Hope replaces Mark Ellis.